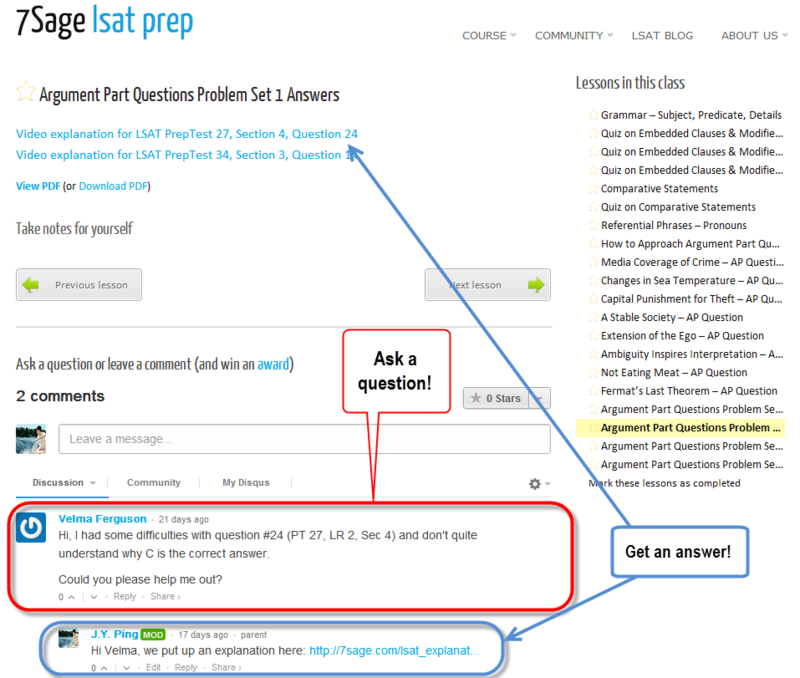 At 7Sage, we run an online LSAT video course. It's not like an in person class - Students love that they can watch lessons over and over again. With our course, you can stick with each concept until you master it. One concern students have is about interactivity. With an in-person course, you can (sometimes) ask your instructor questions. People worry that if they sign up for our course, and don't understand, they have nowhere to turn. But actually, our LSAT course is really interactive! Beneath each lesson, there are comment boards. You can post a question, and other students will answer it. You can answer other people's questions too. Teaching others is actually the best way to learn the LSAT. We instructors monitor the boards too. So if no one answers the question, we jump in. Sometimes, a comment isn't enough. If you need clarification on a tough question, you can post a request for a video. We'll make one just for you. Here's how. Suppose you had a problem with Question 14, from PrepTest 33 (December 2000), Section 3. It's the second question in the "Argument Part Problem Set 1". This picture shows you how to get help, or you can read the guidelines below. 1. Go to the Argument Part Questions Problem Set 1 Answers page in the course. 2. Post a comment along the lines of: "Request for video explanation for Question 14, from PrepTest 33 (December 2000), Section 3." 3. In the comment, say what you want explained. 4. Go make coffee, and come back to find an awesome video explanation! Well, not really - it'll take a day or so. But you should still go make a coffee - it's delicious! Not signed up for one of our LSAT courses? They start at just $179. We could charge 3x as much, but we want to make LSAT education accessible for everyone.